It was a beautiful morning on Fins beach – slight haze holding back the morning sun, a light breeze, motionless sea and a beach peppered with crabs repairing their dwellings. A fox wandered along the sand and a small group of camels ambled past to nibble on the juicy shoots in the bushes behind our camp. 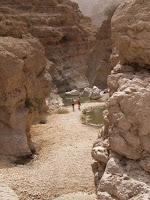 With everything back in the car, we headed for Wadi Shab taking the new exit off the highway. Suitably slathered in creams and potions, we plodded at Holly pace to the pool before the cave. The water was covered in brown crust, which was apparently from plant seeds which would normally be washed away by rain and human activity. Undaunted, Mrs M forced her way through to take Andy to the spectacular cave which most tourists never see. Meanwhile, while I chatted to a local chap about his experiences in Scotland, I met the grumpy ‘guide’ that gave me a lecture a couple of years ago after our group politely (at first) decli ned his services. When they returned, we shared sandwiches and some of Holly’s soggy crusts before heading back to the car past a number of gortex-laden Brits from some expensive hotel. Somehow, Holly made it all the way back with barely a whimper. 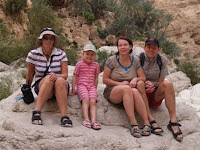 This was an impressive performance for a small child which has become the yardstick - if a four-year-old can get to the end of Wadi Shab, anyone can. The drive home was very quiet both on the road and in the car with the passengers engaging in long periods of snoozing and the occasional snore. With the car unloaded, we barely had enough energy to consume a take-away before everyone’s energy reserves ran out.